BELFRY FIRST BAPTIST CHURCH: located at 90 Black Gem Road (next to Belfry High School). Sunday school 9:45 a.m.; morning worship and children's classes at 11 a.m.; evening Bible study 6:30 p.m.; Monday evening men's Bible study at 6:30 p.m. and Wednesday adult Bible study and children's classes at 6:30 p.m.
BELFRY UNITED METHODIST CHURCH: 109 Main St., Belfry, Ky. Sunday school 10 a.m., Sunday service 11 a.m., Wednesday Bible Study at 7 p.m., Youth meeting Wednesday at 6:30 p.m. and Children's Praise Team Wednesday at 6 p.m. Pastor Michael Stanley. BETHEL TEMPLE ASSEMBLY OF GOD: located at Nolan. Sunday morning worship at 11 a.m.; Sunday night service at 6 p.m.; Wednesday night church at 7 p.m.
CHATTAROY MISSIONARY BAPTIST CHURCH: in Chattaroy. Sunday school at 9:45 a.m., Sunday morning worship service at 11 a.m. and Sunday evening service at 6 p.m. Choir practice follows the Sunday evening service. Wednesday prayer meeting and the children and youth church meet at 6 p.m.
CHRISTIAN FELLOWSHIP CHURCH of GOD: at 510 Rockhouse Road, Delbarton, Sunday Service at 11 a.m., Thursday Bible Study at 6 p.m., Youth Service "Summer Months Only" Monday 6 to 7:30 p.m. Pastor Raymond Ogl. DELORME BIBLE CHURCH: at Highway 49 Edgarton, W. Va., Sunday school 10 a.m., Sunday morning worship 11 a.m. Sunday night 6 p.m., Wednesday night 7 p.m., Pastor Steve Spurlock. EAST WILLIAMSON BAPTIST CHURCH: in Williamson. Sunday school 9:45 a.m., morning service 11 a.m. and evening service 6 p.m. Wednesday prayer meeting 6 p.m.
FIFTH AVENUE CHURCH OF CHRIST: in Williamson. Sunday school 10 a.m.; morning worship 11 a.m.; evening worship 6 p.m.; and Wednesday night Bible study 6 p.m. Pastor Tim Lucas. FIRST BAPTIST CHURCH: of Williamson on Harvey St. Sunday school 9:45 a.m., morning worship 11 a.m., Sunday evening 6 p.m. and Wednesday evening service at 6:30 p.m.
FIRST PRESBYTERIAN CHURCH: on 29 West 6th Ave. in Williamson. Sundays at 10 a.m., children and adult Sunday school, at 11 a.m. for worship service, at noon for coffee hour, and at 12:45 p.m. for choir practice. On Wednesdays at 6:30 p.m. there is prayer service and Bible study at 7 p.m. On second Thursday of each month at 1 p.m. Circle 2 meets, 5:30 p.m., Circles 3 and 4 meet. FIRST UNITED METHODIST CHURCH: on Second Avenue and Dickinson Street. Sunday school at 10 a.m., Sunday morning worship service at 11 a.m. The second Tuesday of each month at 1 p.m. is worship and Holy Communion services at Goodman Manor on 4th Avenue. On Wednesdays at 6:45 p.m. is Bible study, alternating each month with Memorial United Methodist Church (Gum Street, West Williamson). The United Methodist men meet the first Thursday of each month from September through May at 6 p.m. The United Methodist Women meet at noon the second Thursday of each month, September through May. FIRST BAPTIST CHURCH: of Varney, W. Va. has Sunday morning services beginning at 10:30 a.m. Sunday evening service begins at 7 p.m. Prayer meeting is 7 p.m. each Wednesday. Pastor is Rev. Bill Snodgrass. Everyone is welcome. GRACE BAPTIST TEMPLE: located at 1618 West 4th Ave., Williamson. Sunday school 9:45 a.m., morning worship 11 a.m.; evening service 6 p.m.; Wednesday service at 6 p.m. Rev. Ron Sanger. JENNY'S CREEK BAPTIST CHURCH: Sunday school at 10:30 a.m., church services at noon. Tuesday night service at 7 p.m.
LECKIEVILLE FREEWILL BAPTIST CHURCH: 412 State Highway 292 E. located at Goody, Ky. Sunday school 10 a.m., Morning Worship 11 a.m., Evening Service 6 p.m. Wednesday Bible Study held at 11 a.m. and 6:30 p.m. Wednesday youth service 6:30 p.m.
LITTLE DOVE CHURCH OF CHRIST: located on WV State Route 65 N in the community of Little Dove, beside Quality Metal Roofing Company. Sunday Bible school, 10 a.m., morning worship with communion, 11 a.m. Second Sunday each month: fellowship dinner following morning worship. LOGAN STREET FIRST BAPTIST CHURCH: in Williamson. Sunday school 9:45 a.m., Sunday morning worship 11 a.m. Prayer meeting and Bible study each Wednesday at 7 p.m.
MATEWAN CHURCH OF GOD: Hatfield Bottom, announces services: Sunday school at 10:30 a.m.; Sunday family night at 7 p.m.; Wednesday service at 7 p.m.
MEMORIAL CHURCH OF CHRIST: at Alley's Branch, Borderland. Sunday school 10 a.m., morning worship 11 a.m., evening worship 5 p.m.; and Wednesday night Bible study at 5 p.m.
MEMORIAL UNITED METHODIST CHURCH: 504 Gum St., West Williamson. Sunday school 9 a.m., Sunday worship, 10 a.m.; Wednesday Bible study, 7 p.m. rotating with First United Methodist Church every other month. NOLAN FREEWILL BAPTIST CHURCH: located at Nolan has Sunday school at 10 a.m. Church at 11 a.m., prayer meeting and youth group at 7 p.m. Wednesday. Ladies Auxiliary the first Monday of each month and Master's Men the first and third Monday of the month at 7 p.m.
PARSLEY BOTTOM FREEWILL BAPTIST CHURCH: Lenore. Sunday school at 10 a.m., morning service at 11:30 a.m. and evening service at 7 p.m. and Wednesday prayer service at 7 p.m.
SACRED HEART CATHOLIC CHURCH: 110 W. Fourth Ave., in Williamson. Saturday (Vigil Mass) 5:30 p.m., Sunday 10 a.m.; Wednesday, Thursday and Friday 6:30 p.m. (First Wednesday and first Friday 6:30 p.m.). Sacrament of Reconciliation Saturday 4:45-5:15 p.m.; Sunday 9:15-9:45 a.m. Father Thomas Chacko. 304-235-3027. ST. PAUL'S EPISCOPAL CHURCH: located at 411 Prichard St., in Williamson. Holy Eucharist each Sunday morning at 11:30 a.m. and Bible study each Wednesday evening at 6 p.m.
TURKEY CREEK FREEWILL BAPTIST: located at 1011 Taylor Fork Road, Turkey Creek. Wednesday Bible study 7 p.m.; Wednesday youth group 6:30 p.m.; Sunday school 10 a.m.; Sunday service 11 a.m.; Sunday evening service 6 p.m. Pastor Mikey Smith. VICTORY CHRISTIAN CHURCH: of Lenore. Sunday school 10:45 a.m., Sunday worship noon, Bible study Monday 7 p.m., Wednesday Prayer 10 a.m., Wednesday service 7 p.m. and Wednesday youth service 7 p.m. Pastors Terry Jo and Brenda Blankenship. WILLIAMSON WESLEYAN CHURCH: 502 Peter St., Sunday school, 9:45 a.m., Sunday worship, 11:00 a.m. Sunday and Wednesday evenings, 6:00 p.m. Pastor Rick Brookens. 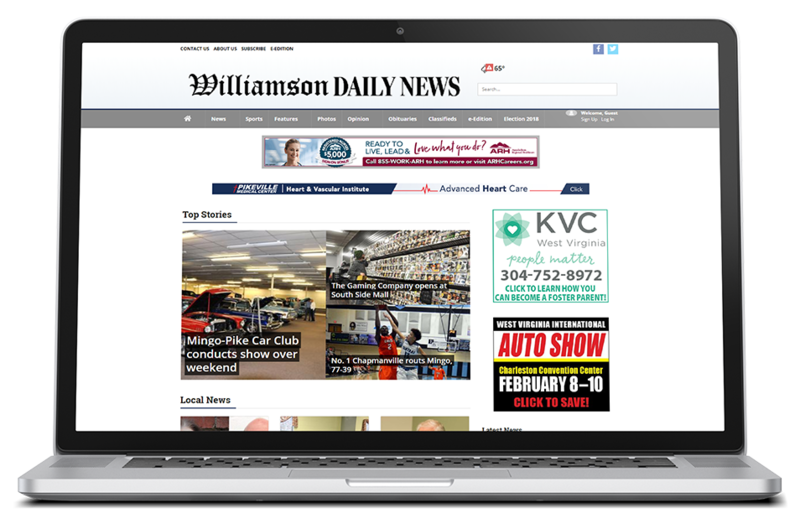 The Williamson Daily News church services list is updating. If your church's information is current and you would like to continue to be listed, you must email klovern@HDMediaLLC.com. If you would like to add your church, please send that information to the same email address.